IT measurements are meaningless if they don’t provide executives with information to make accurate and timely decisions. Yet many IT organizations produce reams of operational reports that provide tons of information yet still leave Senior Management blind as to what actions to take or whether IT benefits are truly being realized. This session provides a solid practical approach for closing the loop between what kinds of metrics should be reported on and how Senior Management can leverage results for effective decision making. Actual examples are including nine key IT measurements that may make IT very squeamish with their power to quickly highlight issues. 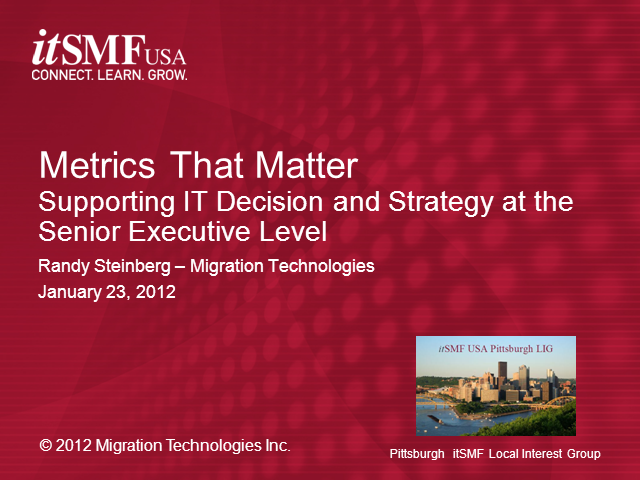 As a result of this session, attendees will learn about what kinds of metrics matter most and how these fit into an overall model for making key decisions. In addition, attendees will get access to a simple EXCEL-based metrics model that they can use right away within their own IT organization. Randy A. Steinberg is a Co-Principal at Migration Technologies with over 25 years of extensive IT Service Management and operations experience gained around the world. He was the lead author for ITIL 2011 Service Operation book. He was an early ITIL champion and served a stint as Global Head of Service Management for a worldwide media company with 176 operating centers around the globe. Randy is also the author of several popular ITIL books: Implementing ITIL, Measuring ITIL, Servicing ITIL and Architecting ITIL, and has been a frequent speaker around the US for a number of nat’l organizations that focus on IT Service Management. His background includes all facets of IT service management for operations, applications, supporting technologies and organizational solutions. He holds an ITIL V3 Expert and ITIL V2 Service Manager designation and is also Practitioner and ISO20000 Consultant certified.